Considering this, I thought it would be fun to write about the four novels Stephen Fry has written over the years, because I have met many the Stephen Fry fan who was not even aware he had written any novels, let alone four. Furthermore, in my opinion at least, these stories are as good as one would come to expect from a man who simply revels in his own startling intelligence and wit. 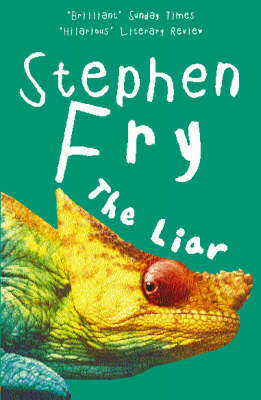 Published in 1991, The Liar was Fry’s first novel, and for many it appears to be his most autobiographical work of fiction (read this alongside his first two memoirs and you’ll see what I mean – if you are wondering about his memoirs, I will most certainly return to them in a later post). The book is centred around Adrian Healey, who goes through a public boys school and Oxford, before becoming a spy of sorts. Throughout this all, Adrian lies chronically, which makes him an unreliable narrator but also brings quite a lot of fun to the story, with revelations appearing suddenly out of nowhere as the book progresses, and old truths suddenly being declared a lie. For a debut novel, this is daring in both story and language, full of vulgarity that may shock and offend some, yet delivered with such eloquence it is frankly impossible not to be charmed by it all. 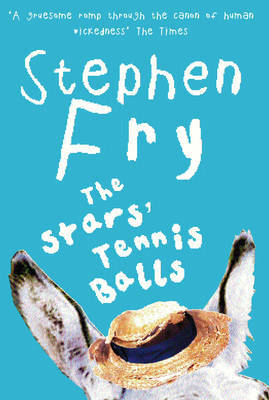 Perhaps Fry’s funniest novel, though maybe not the best place to start with his fiction work. “Ted Wallace is an old, sour, womanising, cantankerous, whisky-sodden beast of a failed poet and drama critic, but he has his faults too. Fired from his newspaper, months behind on his alimony payments and disgusted with a world that undervalues him, Ted seeks a few months’ repose and free drink at Swafford Hall, the country mansion of his old friend Lord Logan. Really, after reading that, buying this book immediately was inevitable and downright logical. The story is partly epistolary, as Ted reports back through letters to his sick god-daughter Jane on the various happenings at the mansion, including the arrival of other house guests searching out the supposed miracles occurring within. The writing style is perhaps more tame in this book than his first, though the story is still outrageously shocking and hilarious at points, and once again brimming with serious and intelligent undertones, as well. This is a good place to start with Fry’s books. Fry’s third novel is arguably his best, and certainly his most ambitious. This alternate history story is also his longest, clocking in at close to 600 pages, and yet it is the sort of book which, once started, is difficult to put down until it’s finished. The story is set around Michael Young, a young historian who meets an ageing physicist obsessed with the horror and atrocities commited by Adolf Hitler before and during World War II. When the two of them discover a way to stop Hitler ever having been born, they follow through with their plan, thinking they will avert one of the world’s worst catastrophes, but when Michael reawakens he finds himself in the wrong country, in a world vastly different from the one in which he grew up, and, scarily, in a much darker and more frightening world too. Slowly Michael realises that this alternate history turned out far more horrific, in ways he could never have began to imagine. It was a daring line for Fry to take with this story, but he pulls it off convincingly, not taking any short cuts and not holding back at any points, and delivers a truly stunning and thought-provoking novel. This is definitely my favourite work of fiction by Fry, and I would highly recommend this to any history buffs out there. This novel, published in 2000 (and with the title changed to Revenge in the United States), is Fry’s attempt at a psychological thriller, and was largely inspired by The Count Of Monte Cristo by Alexandre Dumas, being, essentially, a modernisation of that classic tale of revenge. It begins in 1980, as seventeen year old Ned finds all the pieces of his life – education, work, even a beautiful girl – coming together perfectly. However, a few badly timed events lead his life in a completely different direction, and the novel instead follows this new phase of his life, and, eventually, the vengeance he seeks to make upon those who caused these changes in his life. 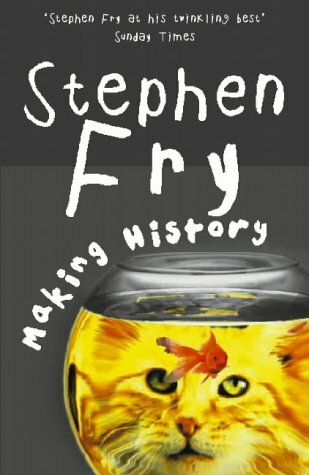 While still funny, this novel is tinged with a sense of bitterness and anger which gives it a sizzling energy as you turn each page, and simply adds to the growing evidence that Fry is a master of the English language, and a genius of storytelling. 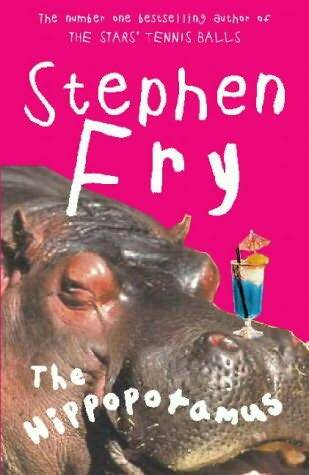 Have you read any of Stephen Fry’s novels? If so, what did you think? If not, do you think you would read them? This entry was posted in Books and tagged Book, Books, Making History, Stephen Fry, The Hippopotamus, The Liar, The Stars' Tennis Balls. Bookmark the permalink. ← Do you listen to music while writing? This is so strange. I wanted books yesterday, and my friend picked up a Stephen Fry. And today, you write a post about him. Brr. But that is a pretty funny coincidence. I do love Stephen Fry though, I have almost all of his non-fiction books too…what book did your friend pick up, if you can remember? Erm. I don’t remember. I didn’t really pay attention to it at the time (I was drooling over all the Abolute Sandman volumes that I couldn’t afford). Absolute! Absolute Sandman! Argh, see? Definitely the keyboard. I know my Zeppelin! Shh. Let’s just forget the whole alphabet-eating incident, shall we? Paperweight. Have you read that one? That sentence looks wrong. But there’s no singular form of the word X-Men, is there? That would sound even worse. Oh well. Life would be amazing as one of the X-Men. 🙂 For the longest time as a kid, I used to wait for something extraordinary to happen, and then have a bald man in a wheelchair turn up and tell me I was responsible (and awesome) and that I was invited to the Institute. Sigh. Ah yes, I have read Paperweight. It’s all the articles he wrote for a newspaper over a couple of years, back in the early 90s if I remember correctly. So some of them are a little out of date but still interesting all the same. Ah, I imagine The Liar would translate quite well into audio? I have heard they want to make that into a movie too, but it might just be a rumour. I agree, he is quite the amazing man! His memoirs are amazing too if you haven’t read them before, Moab Is My Washpot and The Fry Chronicles…the ending of the latter left me with my jaw hanging open (only Fry could end a memoir on a cliffhanger 😛 ). Yes I have read Moab is my Washpot and was so impressed by his honesty. I haven’t read the Fry Chronicles, – my word I’m going to have to put in for a life extension!! so many books only so many heartbeats! I agree, he is brutally honest in Moab is my Washpot. The Fry Chronicles is interesting – it follows directly on from Moab, from beginning College to the beginnings of his comedy career. I think it follows the next eight or nine years of his life, to his late twenties/early thirties, and it’s mostly a happier time for him (though still a great read), but it does end on a massive turning point in his life, one which as I said left my jaw hanging, and he just simply says “but that’s a story for another book,” so he must be planning to write more of these memoirs down the track. I know he was writing something in his spare time while on the set of The Hobbit, these last few months. Stephen Fry almost saw me naked….. He was the Rector at Univeristy of Dundee while I was studying there, and our halls of residence was a condemmed building, and we asked him to come around to have a look. I was lying drunk and naked in bed as he was looking around, and as my door was open he went to walk in. Lucky my girlfirend at the time saw the state I was in and closed the door before he came in. Did you speak to him at all after that odd encounter? No, I was farily comatose at the time, it was only afterwards I was told about it. My girlfriend was just coming out of the shower, and was wrapped in a towel. She exchanged greetings and hello’s with him. A great story there, thanks for sharing that one! Yeah, he’s not as big in movies as on television (having said this, he was in the second Sherlock Holmes movie recently, and he will also be in one of The Hobbit movies (the second one, by memory)). But on television he’s been in Blackadder, A Bit Of Fry and Laurie, Jeeves and Wooster (all of these with Hugh Laurie, who is more famous these days for House), and most recently the quiz show QI. He also has done quite a number of documentaries and a few other shows. He’s one of those actors, once you become interested in him you realise just how much he has done. Haha, they don’t sound like your kind of books? I have not read any of his novels but now I must read “Making History”, sounds like a fascinating and terrifying story. I’ve been following his Twitter-feed for some time and he is such a Master of Words. Making History is fascinating – I was quite surprised when I first read it with just how good it is. I think what grabbed me wasn’t just his suggestion that a world without Hitler might have become even worse, but the way he made this alternate history worse (which I won’t reveal, but it is awfully clever). He’s great on Twitter too, isn’t he? 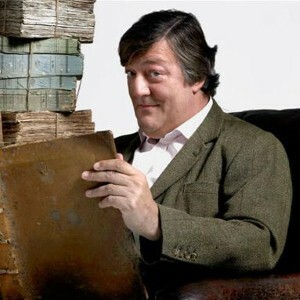 (Both him and his silly alter-ego Mrs Stephen Fry). Will be interesting to see how the world will be depicted, what kind of dystopia he has created. Aha, his alter-ego is on Twitter also? I’ll have to check that out. Let me know your thoughts on it when you do read it! I’ve read all of these, except Making History, which I will have to chase up. They are, as you say, quite shockingly vulgar at points, but also quite terrifyingly funny sometimes, so that you are dragged through them almost against your will. I did find the Stars tennis Balls much harder going (and much darker) than the others, but the first two were great. Hahaha how weird is that? Geeze, maybe I do have some sort of psychic powers of which I was previously unaware? Or maybe Stephen Fry has just been on television a lot and people have thought “oh hey, he writes things too, doesn’t he?” all at the same time. He’s definitely worth reading, very entertaining and witty to say the least. Well, I chose “Stephen Fry in America: Fifty States and the Man Who Set Out to See Them All.” It’s not a novel and it’s not his biography, but I thought it would be a good first choice for me. I wanted an introduction to his style and I thought that maybe his observations on American life would be insightful and funny. 🙂 He tours America in a black London cab. 🙂 After I read that, I kinda had to get the book.